Included in delivery: SSKeyStore.exe – an installation program compatibe with Windows NT/2000/XP/Vista/Windows7. The installation program installs a program of the same name with which Keystores can be built and maintained. The current status of the borrowed license can also be seen. Key files are given the name sskeys.dat, and can be stored on a Windows, Samba, Wine or Novell based file system. Usually, a single user team can be created for a single key file. The individual users need read/write/modify rights for the directory with sskey.dat and for sskeys.dat themselves. Concurrent use of floating licenses is regulated through the number of floating licenses in the Keystore. When Enterprise Architect is used on a client computer for the first time, the license is requested: the path to the Keystore is to be entered. The “Deployment of Enterprise Architect” document explains how you can pre-set the path to the Keystore during an automatic (msi) installation, so that this entry can be omitted for the user. The change from Named user to Floating does not require a new installation of Enterprise Architects on the user’s computer and can be configured on that computer via the license menu (Help | Register and Manage License Key(s)…). The first icon allows an additional keystore to be created; the second icon allows the as-yet unlinked Keystore to be added to the list of managed keystores. In the File menu one can also delete a keystore. 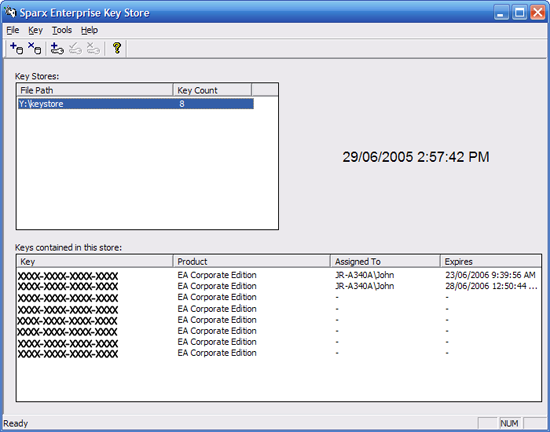 The linked keystores are shown in the upper window and can be selected there. 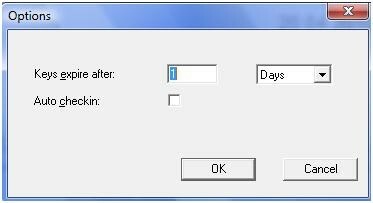 As soon as a keyfile is selected, the contained licenses are shown including the current assignment status. Insertion, release and deleting of keys is then possible – the activating icons are placed in this order. Note: The “Query” option is not very well liked among administrators because licenses are often not returned due to lack of experience. A license can also be inadvertently retained in the “Silent” option: when powering Enterprise Architect down, to connection to the Keystore might be established. An offline user receives a notice one day previous to expiration of the checked-out license that the license will expire. Once the pre-set period has run out, the checked-out license is no longer usable and another user may check this license out in the Keystore from that time forward. All MDG floating (plugin) products may also be administered via the Keystore / with SSKeyStore.exe. When opening the complementary application (VS Studio, Eclipse,…) you will be asked whether the plugin should also be opened. Upon confirmation, a key from EA and the plugin will be required. When you wish to move the sskeys.dat file into another directory or disc, this must be done via SSKeyStore.exe by creating a new keystore and transferring the licenses into the new keystore on the user interface. Moving the file over the operating system is possible, but the next time the program is used the Keystore will be marked in its new position as corrupt and is no longer usable! Therefore, the Keystore should not be installed on redundance systems that automatically mirror to other hardware positions.